Our latest video was produced for the hot new Startup, Wayin, which is the brainchild of Sun Microsystems co-founder Scott McNealy. Thanks to a strong collaboration with the folks at Wayin we got to the finish line quickly and without a lot of fuss. One thing that’s great about this project is how well Wayin integrated it with their Web site. Below is a screen shot. Note the prominent placement of the video at the top with a big honkin’ play button. Nicely done. Wayin didn’t stop there. They also integrated artwork from the video into their app landing page. 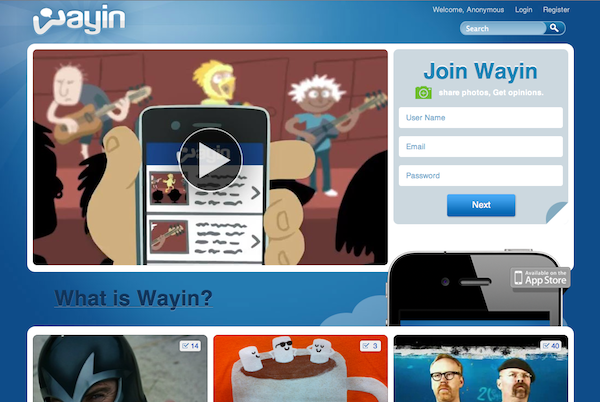 This is the first screen that new users see when they fire up the Wayin app. It’s just another example of how Nutshells, thanks to their high production values and exquisite artwork, can be integrated into a complete experience.